The Trompeter UPL2000 is a classically robust, high frequency, true 75 ohm BNC connector that is designed to handle high bit-rate digital video signal transmissions in conjunction with the low loss coaxial cables used in broadcast applications. Trompeter design engineers understand the unique problems associated with the combination of high data rate digital traffic and high frequency transmissions. The unique design of the UPL2000 allows for an impedance matched transition through the connector, taking advantage of the electromagnetic effects that are so unique to high frequency transmission lines. 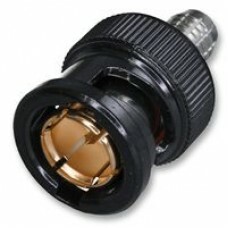 The signal is contained within the inside surface of the outer shield through the connector in much the same way that the braid of the coax cable contains the electromagnetic energy of the signal within the cable dielectric itself. This effect is more pronounced as transmission frequency rises, as is the case with DTV and HDTV.